On this page I will present some ideas of Palanga vacation activities and a brief summery of Palanga events. In summer time Palanga is often referred to as the summer capital of Lithuania. You can say it becomes the centre of action with its lively bars and cafes, fun fairs, shops, music clubs and famous nightlife. and with Palanga Spa centres this surely makes for a beach-holiday with a difference. John and I have fond memories of Palanga as there are always interesting and exciting things to do. If you love sun-sand-and-sea vacations, Palanga is a wonderful spot in summer time. Indulge in the pleasures of the sea and sun on its fine sandy beach with a backdrop of dunes and pine trees. Palanga beach was given a blue flag status, which means it complies with international standards of cleanliness and safety. For those who are aiming for an active holiday, Palanga offers a number of sport facilities to stretch your muscles, such as water sports, tennis courts, bicycles, saunas, yachting, carting,wind surfing you name it! On the beach, close to the pier, there is an excellent ground for beach volleyball, every weekend in the summer competitions are held here. Go to Sea Rescue Station if you wish to rent surfboards, jet skis and other amenities. You can rent bicycles and roller blades on the streets and also in most holiday homes, hotels and guesthouses. A number of hotels and holiday homes have their own tennis grounds. Most of the big hotels will also organise horse riding. Riding a horse near the sea was one of my unforgettable experiences. If you enjoy bowling, try it at Vytauto Street 98. Open swimming pool "Linas" is at Vanagupes street 22. Pamper yourself at one of the luxurious Spas in Palanga. Since 2005 Palanga has been a member of European Spas Association (ESPA). Palanga has a number of spas and beauty salons that provide highly professional facials, body treatments and massages. Palanga hotel has one of the largest spa centres in town. 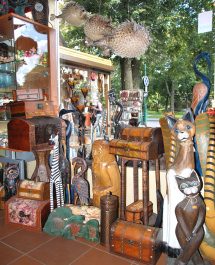 If you walk down Basanavicius or Vytauto streets you will find a number of souvenir and folk craft shops and outdoor stalls selling amber, woodcarvings and handmade ware. As Lithuania is the source of much of the amber in the Baltic States, Palanga is one of the best places to get amber pieces and jewellery at lower prices. Amber or (Gintaras in Lithuanian) makes a great souvenir to take home. Lithuanian-made high quality linen napkins, tablecloth or clothes are also popular buys. If you are looking for designer clothes shops stroll along Vytauto Street. After you among hundreds of others see the sun setting from the famous Palanga pier, plenty of nightlife choices open up in the main area. It’s hard to mention the current main hotspots in town as they tend to change often. However, clubbing enthusiasts are bound to find something to their liking. A number of colourful bars, night-clubs and casinos line up Basanavicius Street. You will also find plenty more options in other parts of the town. Cinema "Naglis" at Vytauto Street 82. Lithuanian and international bands perform at different hotels and retaurants. Every year at the end of June the summer season in Palanga is opened with a Summer Feast. Among other events concerts, street shows are organised, you can take part in sports competitions, visit craft fair and watch fireworks at the Sea Bridge in the evening. On June 23 Midsummer’s day is celebrated. At end of July classical music concerts called “Night serenades" are held in Tiskevicius palace (Amber museum). In the middle of August an interesting festival of amateur theatre takes place. Also in August if you are a dog lover you are welcome to visit the international Dogs' Exhibition, held in the town stadium.